I purchased this vintage piano stool at an estate sale a few months ago. It was in really bad shape but I had a vision! After an overall wipedown I painted with Annie Sloan Chalk Paint in Arles. It took a good 2 coats to acheive complete coverage. I then did the clear wax/dark wax ritual. She is now waiting for the perfect home! This is a lovely desk and chair that I have recently refinished using Annie Sloan CoCo Chalk paint and accented with a creamy white. 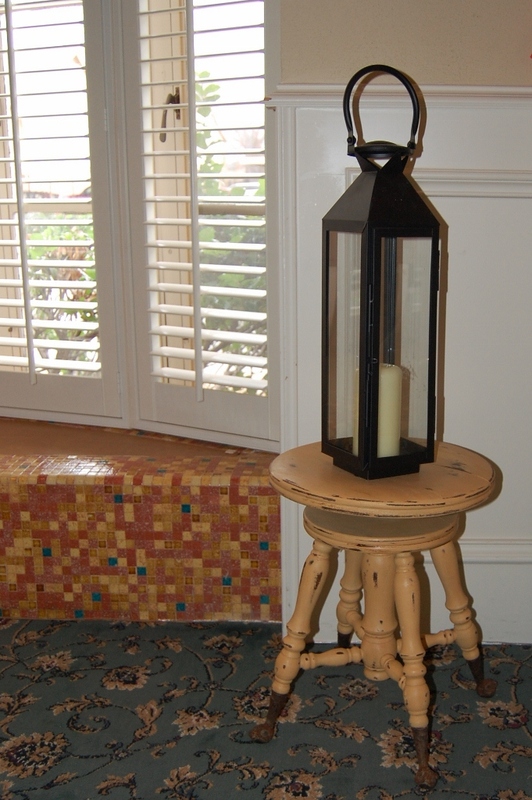 It has a handrubbed wax finish that just adds so much character and charm! 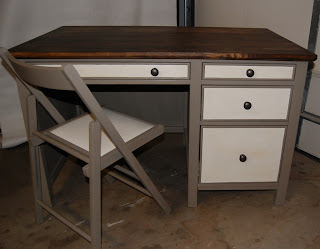 The desk measures 48" long x 30" tall x 30" deep. 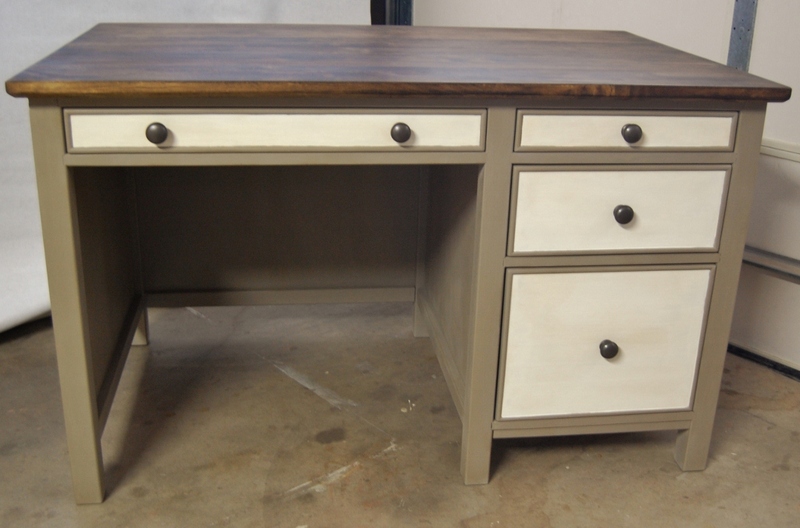 The top left drawer front drops down to accommodate a keyboard. I apologize for the bad photos; they were not taken in the best light! 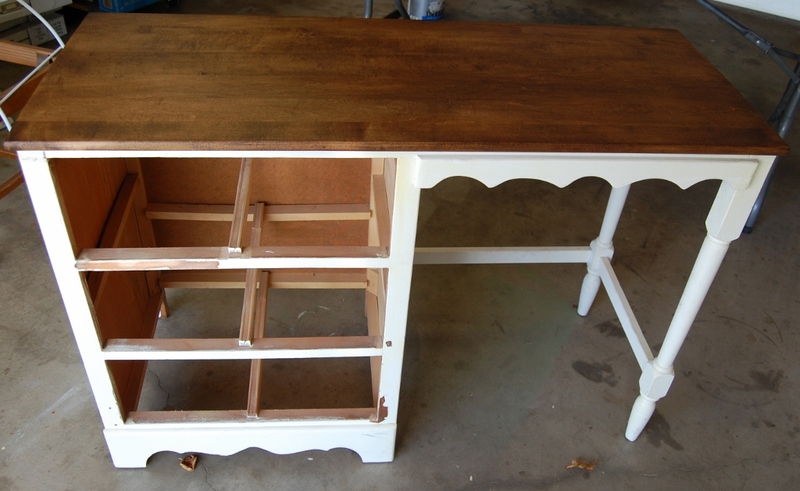 It is on sale for a special price of $150.00 as I have a lot of client pieces to get to and need the space in my workshop! Message me for more information! 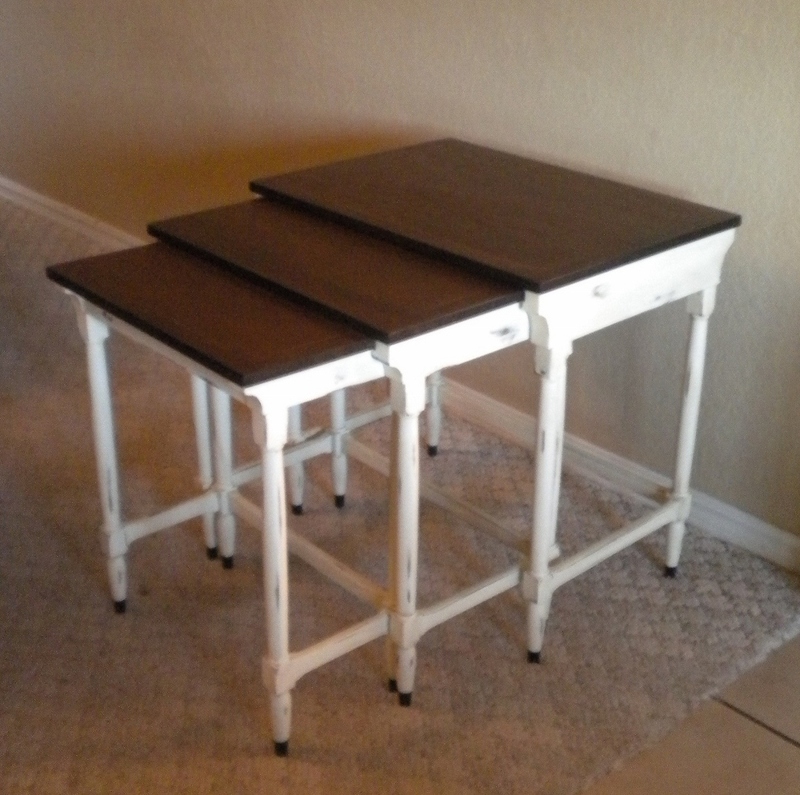 I bought these 3 nesting tables BB (before blogging!) with the hopes that I would someday be able to show them to the world. I didn't know enough to take step-by-step pictures but I did snap a few shots along the way. Here is a side view after I had already stripped the top. 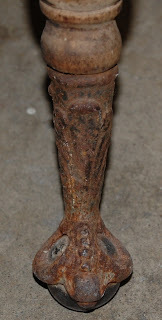 I had also already spray painted the little feet with ORB paint. 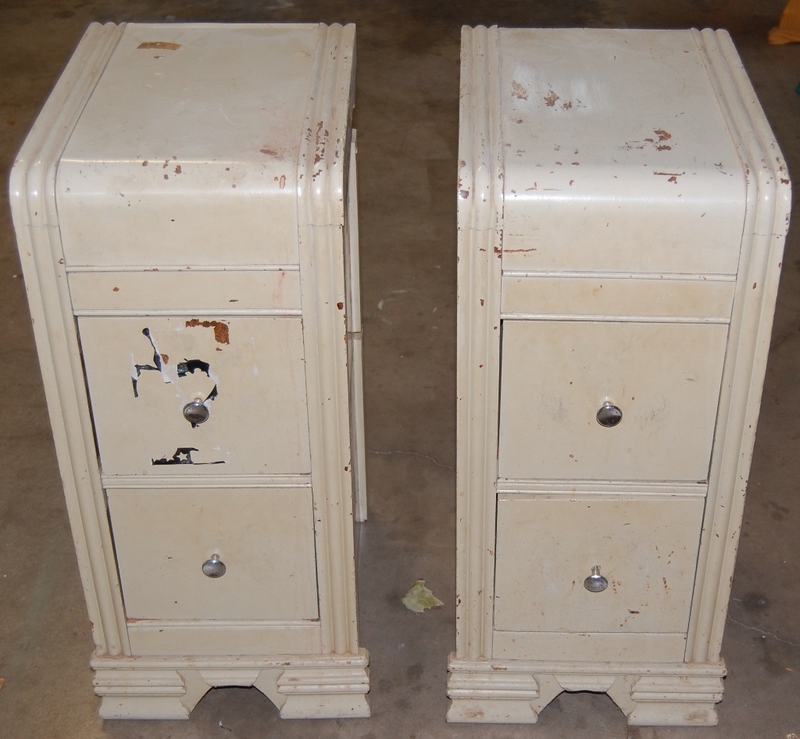 Now imagine an ugly greenish-colored wood top and mutliply it by 3 and you will know what the set looked like! I filled holes, sanded uneven areas and stained the tops with Minwax dark walnut. There are no pictures of the next step but I finished the tops with a poly and after that had dried I taped the tops off with newspaper and painter's tape and then spray painted the legs and aprons white. I don' remember the exact brand or color but it was most likely Heirloom White. 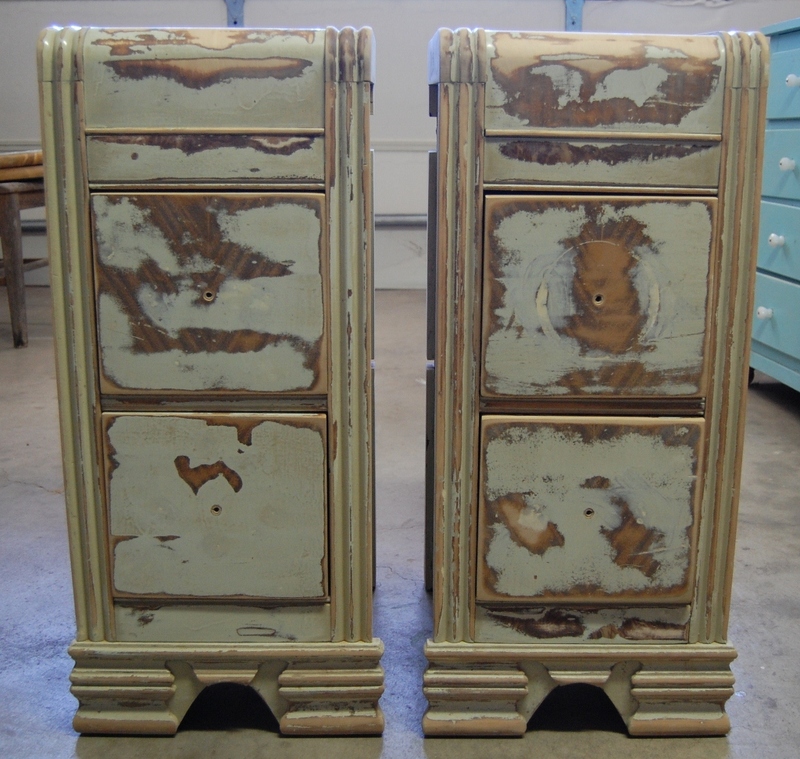 After some distressing and glazing they were posted on Craigslist. I'm working on an awesome antique wardrobe for my Daughter's room that I hope to have finished today so stay tuned! 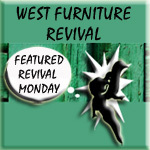 Please visit West Furniture Revival to read the post and enjoy all of the inspirational projects that were featured! 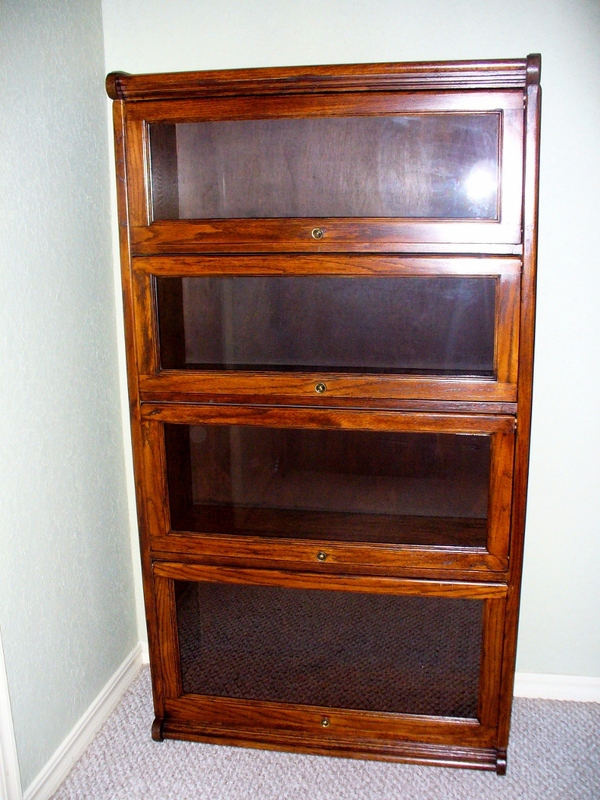 My pieces that were featured are Miss Frenchy and the Barrister Bookcase. These lovely ladies came from the Neighborhood Sale that Cassie from Rustic Raspberry and I went to in May. They weren't too lovely in the beginning. They were a bit haggard and tired. 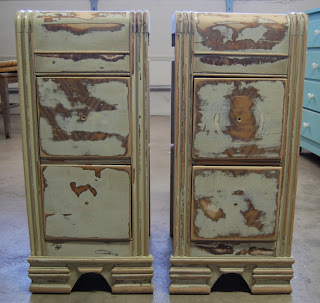 The young lady I bought them from said that they were originally a part of her vanity. She went away to camp and when she returned, her Grandmother had cut them apart. Sigh~a Grandmother after my own heart! 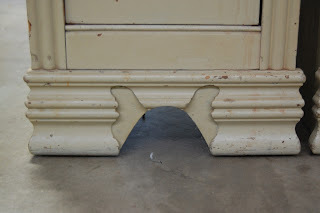 I didn't want to spend days stripping the curved, fluted trim so I decided to sand these girls instead. It took the better part of the morning! After they were sanded and cleaned I painted with my Glidden Black in Eggshell finish. 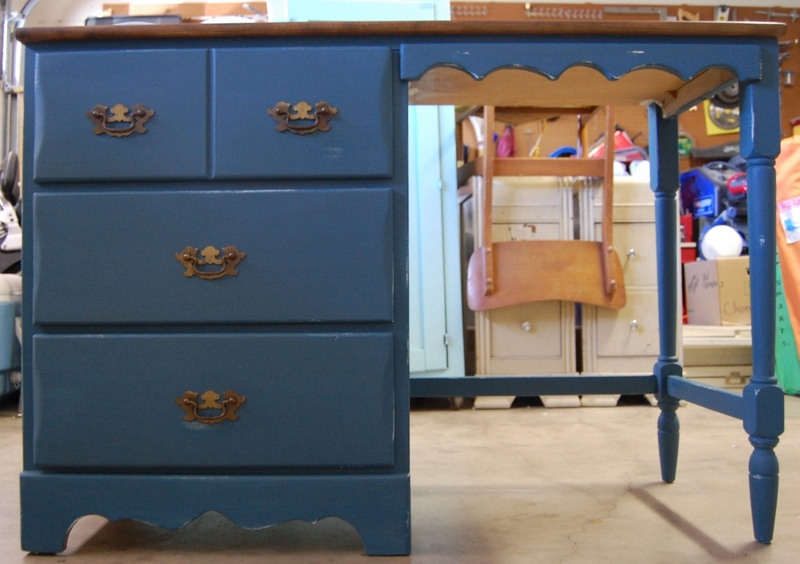 I love this paint! I use it on all of my black pieces. 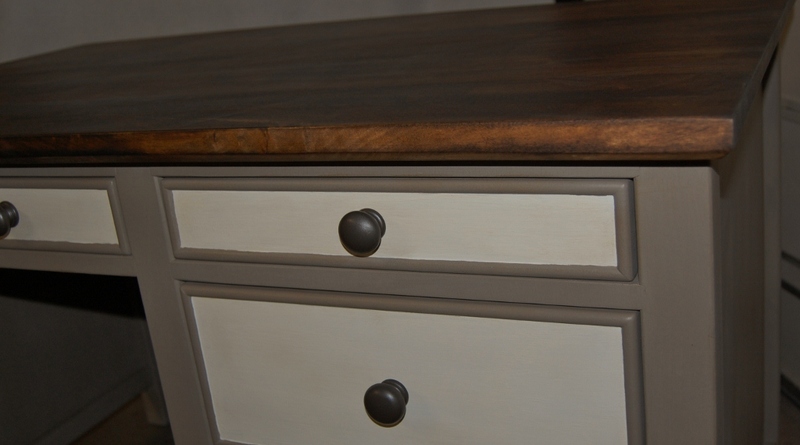 I spray painted the knobs with a satin finish brushed nickel. Everyone who saw these lovelies wanted to take them home and they did leave with a really sweet lady. More about her a little later! Now on to the Handsome Boy. I bought this little box at an estate sale. It was in the garage (my favorite place to look) and was yucky dirty! I had already removed the knobs when I remembered to take a picture. 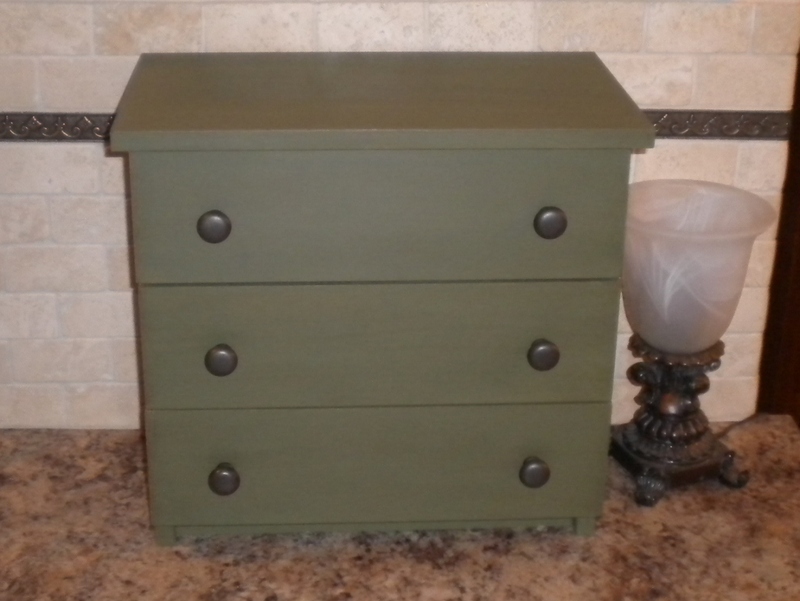 I wanted to paint this one with my Annie Sloan Chalk Paint in Olive. 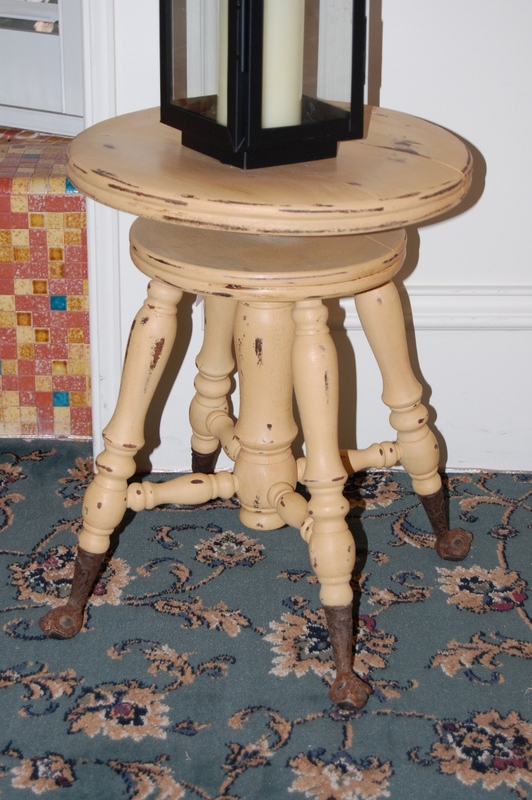 I brought it inside the house to paint because I have heard that the ASCP dries really, really fast. We have been having high temps of 112° lately so I didn't want to paint it in the garage! 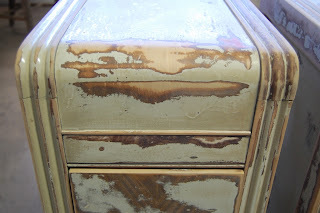 I painted two coats and still had the original paint showing through in some places. 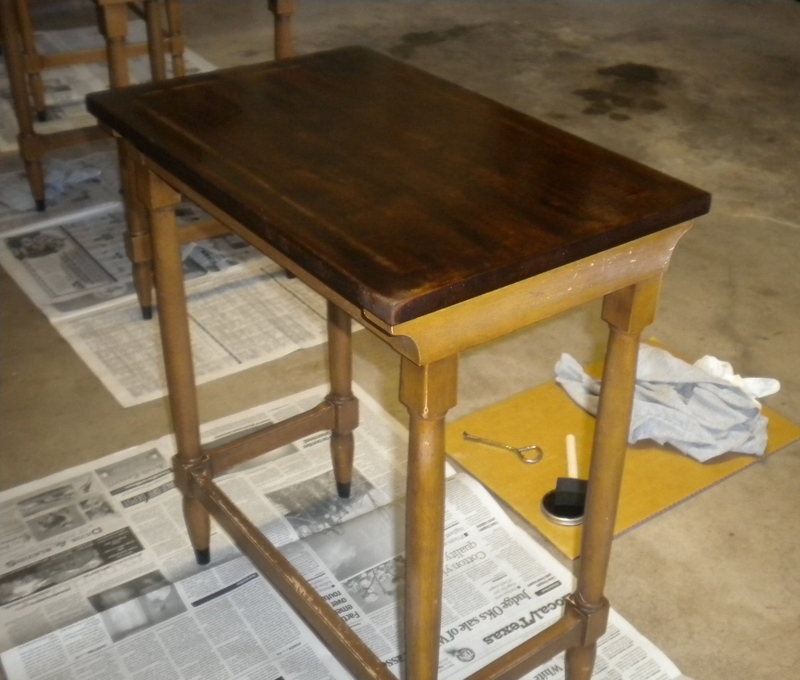 After the third coat had dried, I used a little dark walnut stain to distress it. 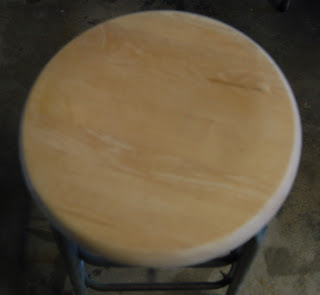 The next morning I waxed with Minwax clear wax and then special dark wax. I freshened the hardware with a coat of Rustoleum's dark bronze spray paint. I really wanted to keep him but had no where that he would fit! 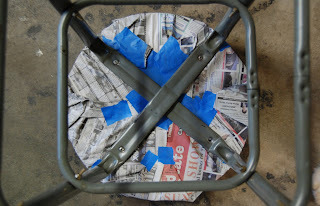 Love the concept of no prep work ~just clean the surface and start painting. Short working time~ it dries too darn quickly sometimes. 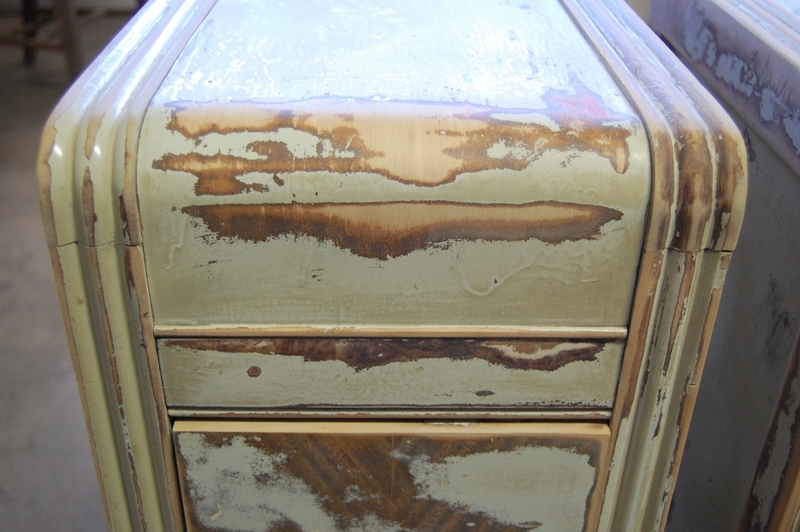 So, whilst painting three coats I pondered how many steps I would have gone through if I hadn't used my ASCP. 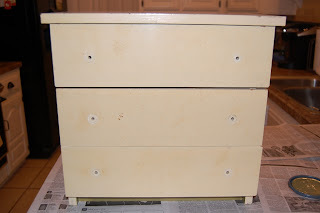 First coat would have been primer. Second coat would have been an olive green paint. 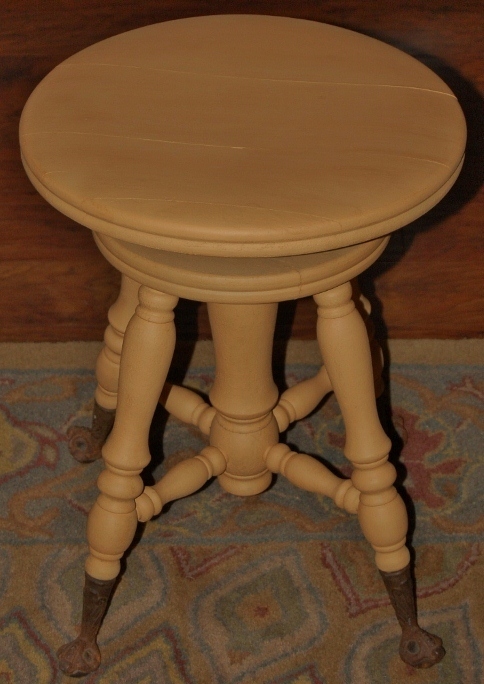 Third coat (if needed) would also have been the olive green paint. Hmmmm, that's 3 coats. And, it would have cost a lot less money! 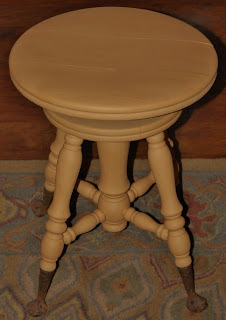 I have bought some flat finish paint to test on an antique armoir for my daughter's room. 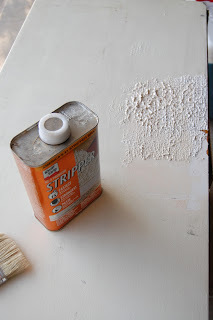 I am going to see how fast it dries and how quickly I can sand and distress it. I'll post a review as soon as I get it finished. Now, more about the Sweet Lady, D'wana, that bought the nightstands. 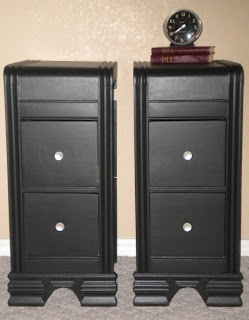 I posted the nightstands, the small box, the metal stool, and a garden bench on Craigslist. I received a call from someone who wanted to buy it all, sight unseen! She asked if I was friends with Cassie from Rustic Raspberry and did I have a blog too? I replied "yes" and she knew who I was. I felt famous! She came and bought everything that I had posted on CL that day. Then, she drove to Cassie's and bought some things from her. 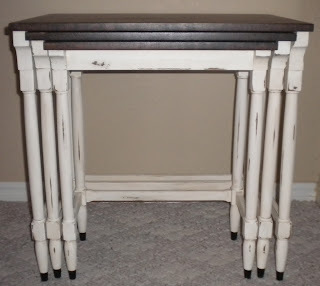 She then came back to my house and bought my Frenchy Helix Cocktail table (the first buyer backed out and the poor girl was still for sale)! My garage is almost empty now! My Husband was so happy! I was so happy! Thank you, D'wana, for shopping at my garage! 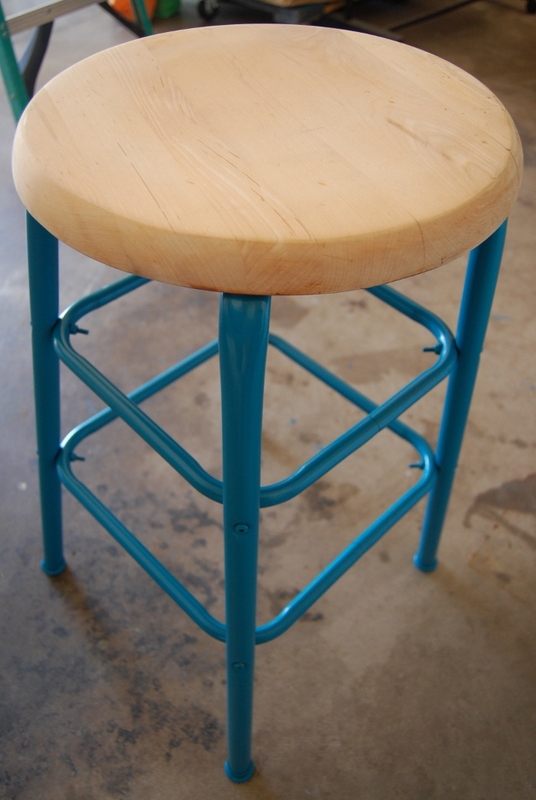 I picked this metal stool up at an estate sale. 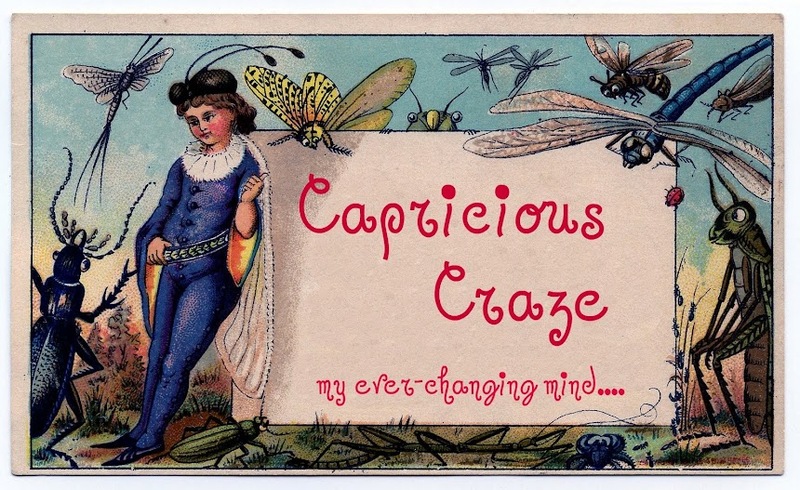 I had seen a few on blogland and felt the need to refinsh one for myself! There was an old sticker that wasn't coming off. 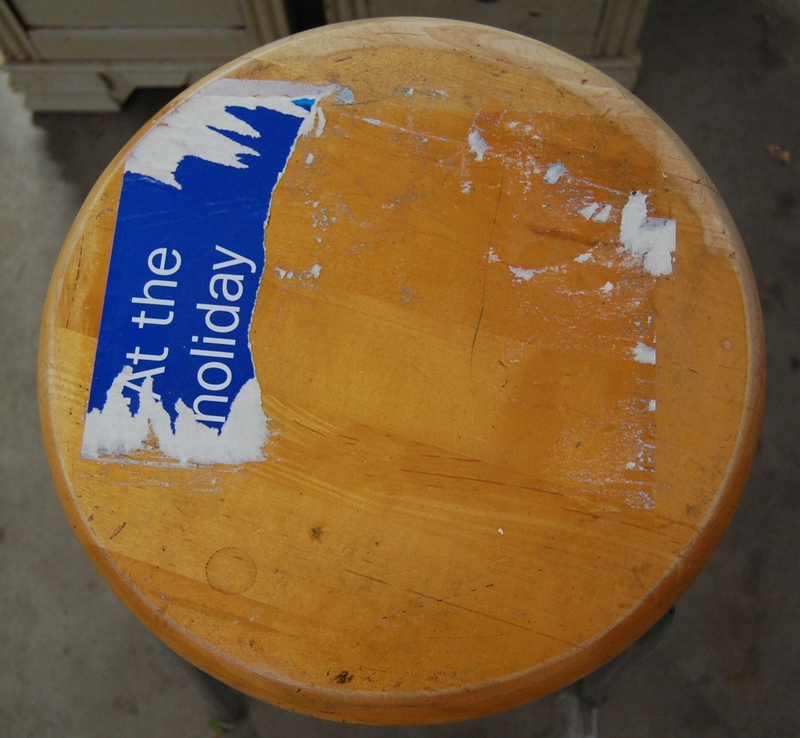 I used KleenStrip to remove the sticker and old finish. Next I sanded the top smooth and covered it with newspaper to prepare for spray painting. I wiped down the metal legs and spray painted them with Rustoleum's 2x Lagoon. 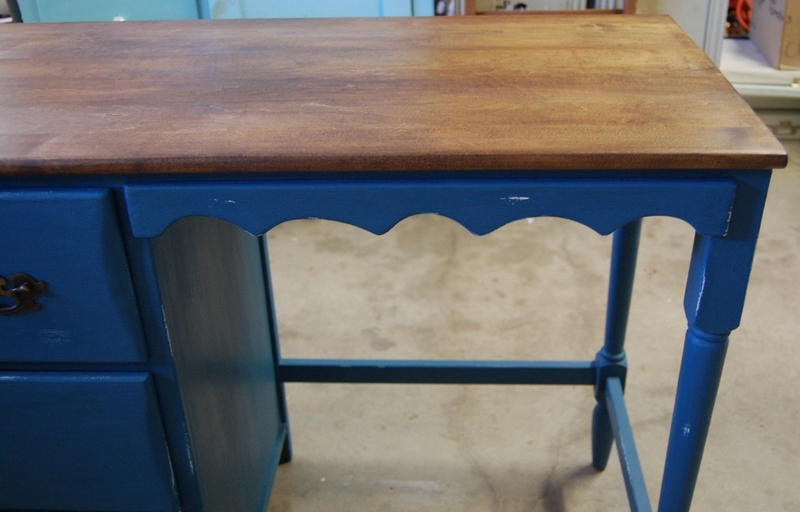 The blue was a little too bright for me so I wiped it with Minwax Dark Walnut. Then I stained the wood with the Dark Walnut. I made a stencil using Microsoft Word and printed it out on card stock. I choose the outline option so I didn't use tons of ink! 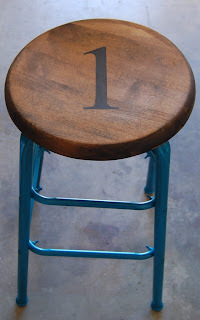 I then used an exacto knife to cut the number out leaving me a perfect stencil! 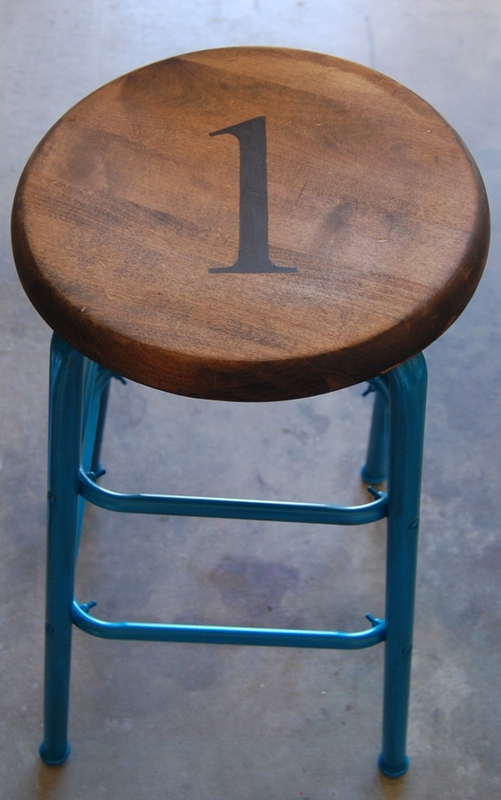 I secured the stencil with painter's tape and used a small artist brush to paint the number. When the black paint was dry, I waxed the seat with Minwax dark wax. 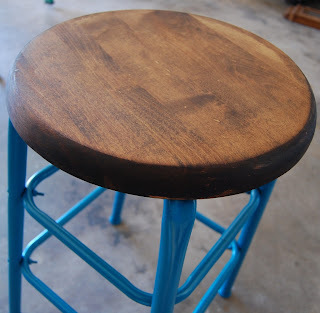 I can now cross "buying an old metal stool with a wooden seat and refinish it" off my bucket list! This tale starts with an ad on Craigslist. A cute little desk was advertised but it was in an unsavory neighborhood. I happened to be talking to Cassie from Rustic Raspberry about it and how I doubted my Hubby would want to go get it when he got off work because he would be exhausted. Turns out he loves me so much that he took me to get it! Cassie texted me later to ask if I had picked it up. I said 'yes' and she, of course, wanted pictures! Well, the unexpected happened! 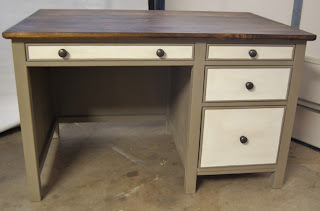 Cassie wanted this cute little desk for herself! 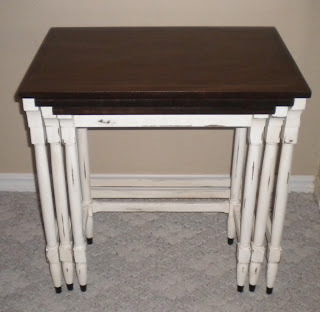 We went back and forth on what to do and finally settled on me painting it for her using her Aubusson Chalk Paint. 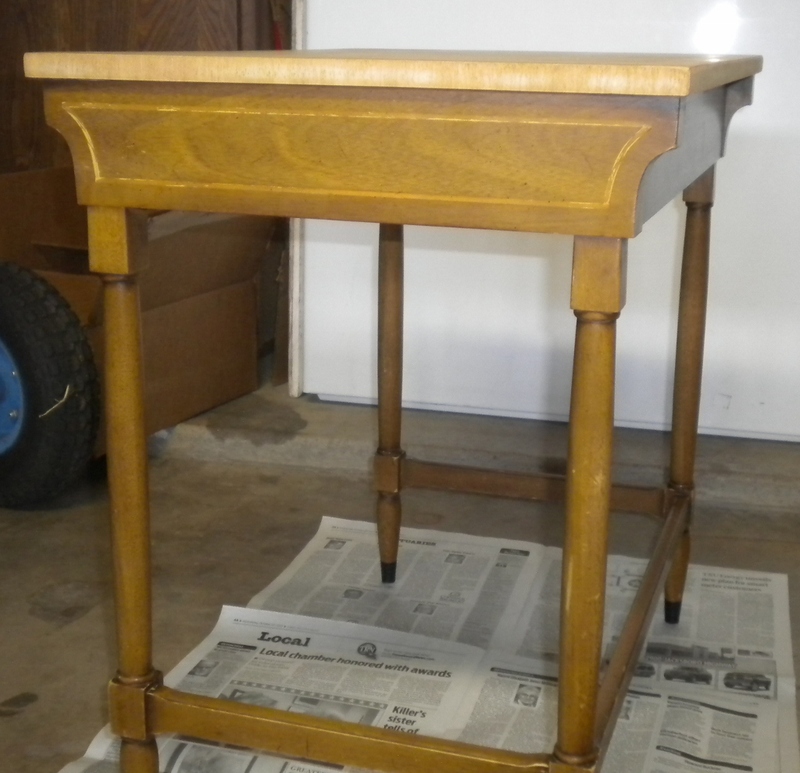 First the top had to be stripped so I could stain it with Minwax Dark Walnut. On this piece, I used Klean Strip. 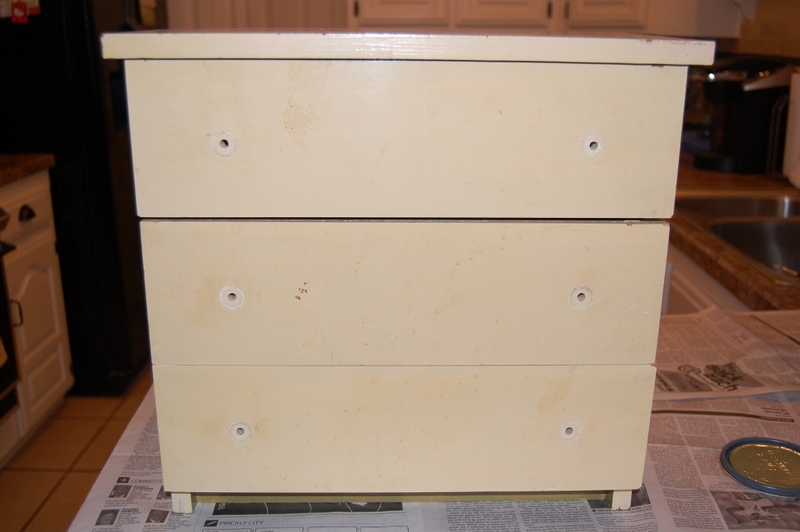 After I had the stripper and old paint removed, I sanded the rest smooth. You can see on the left what it looked like after the stripper but before sanding. 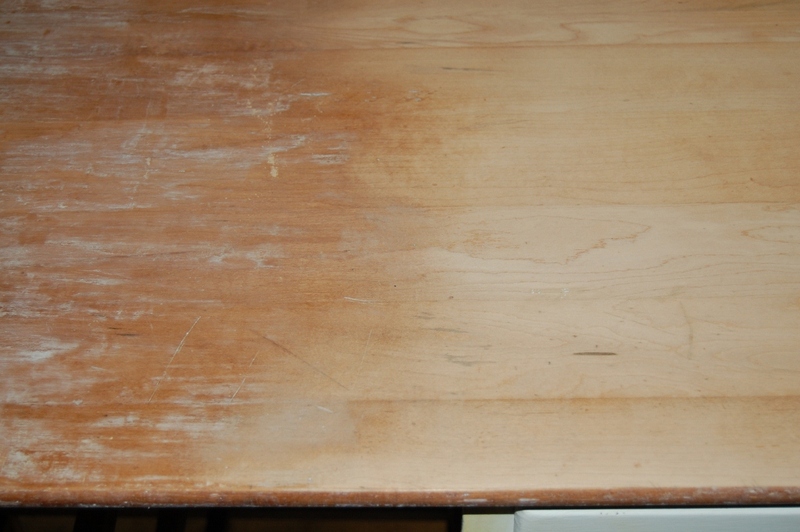 After sanding, I applied Cabot's wood conditioner and then stained with Minwax dark walnut. When the stain was dry I waxed it with Minwax dark wax. 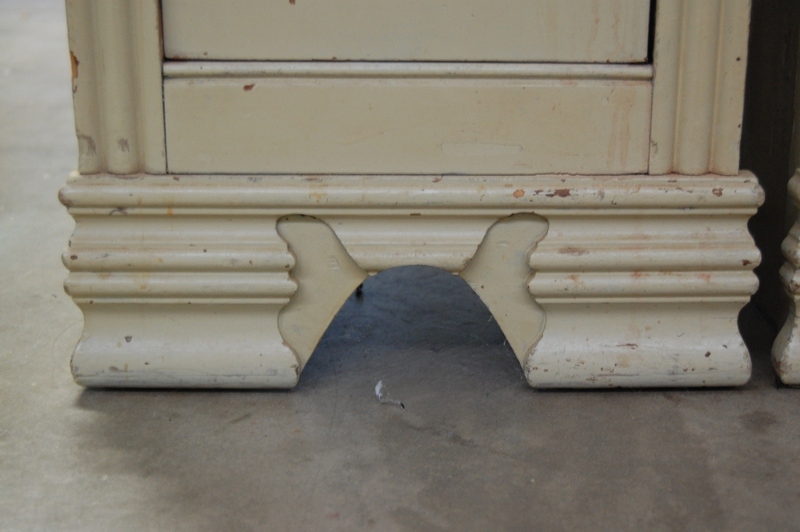 There was a very minor structual issue in that the bottom middle was resting lower on the ground causing the desk to rock back and forth. I can't explain how we fixed it where it will make any sense! 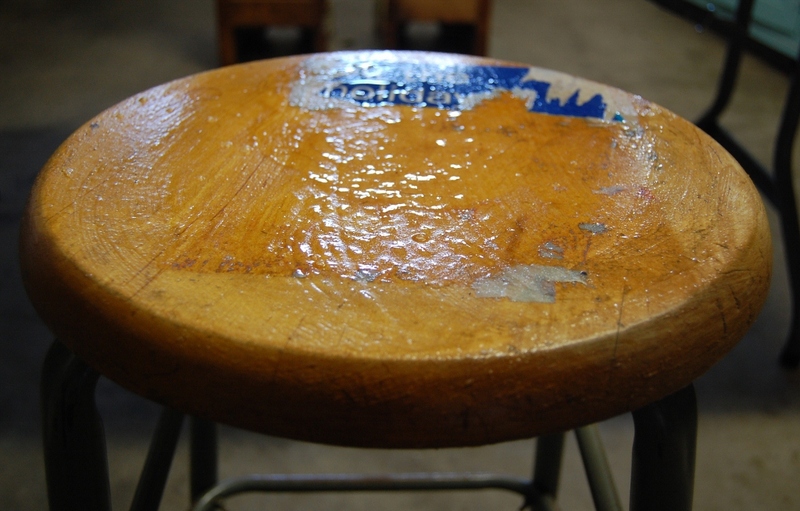 It did result in us using wood glue to make sure it didn't happen again and that wood glue dripping down. 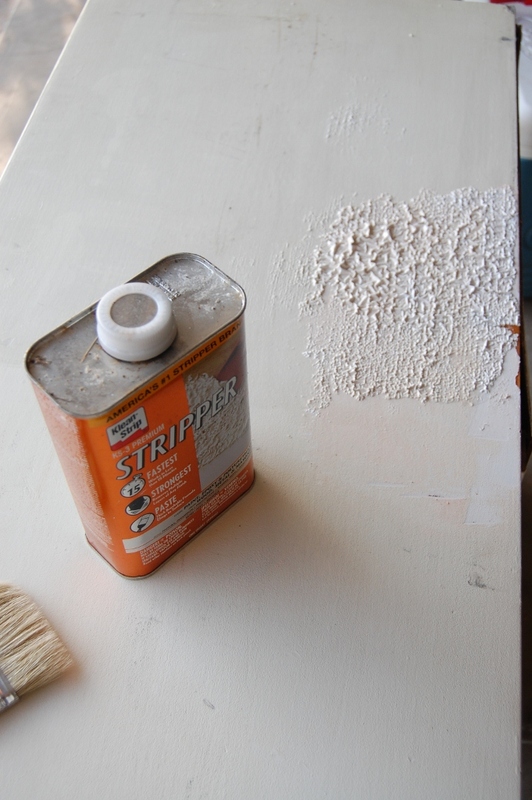 When I removed the drips some of the paint lifted off. Well, one thing led to another and I ended up stripping the entire inside panel. 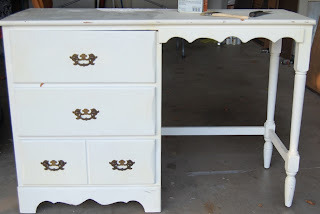 I knew that the Chalk Paint could just be painted right over it but there would be very obvious uneven places. Whew! If you are still reading, thank you for sticking with me! 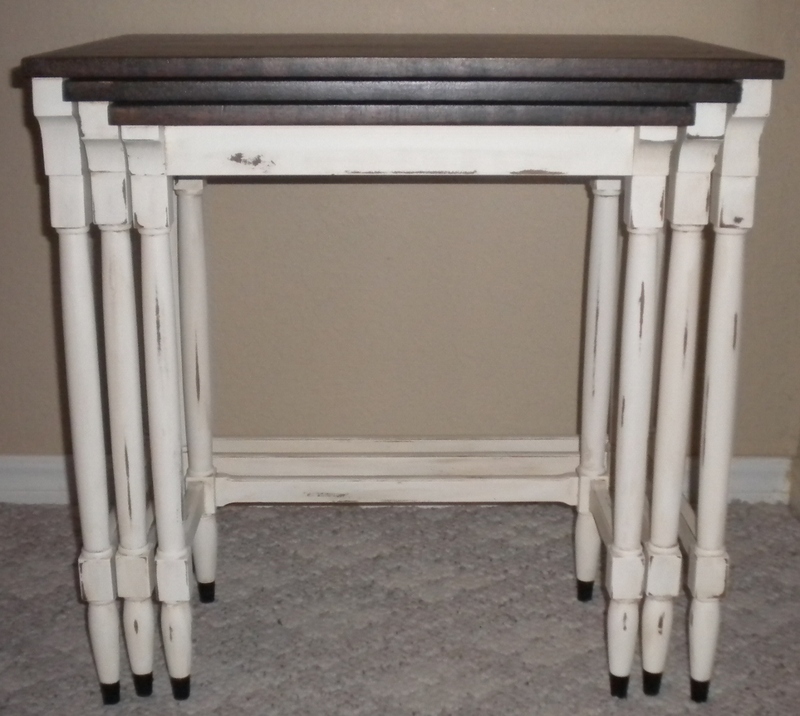 I then painted two coats of Annie Sloan Aubusson Chalk Paint and distressed to show a little of the white. I applied the clear and dark waxes. 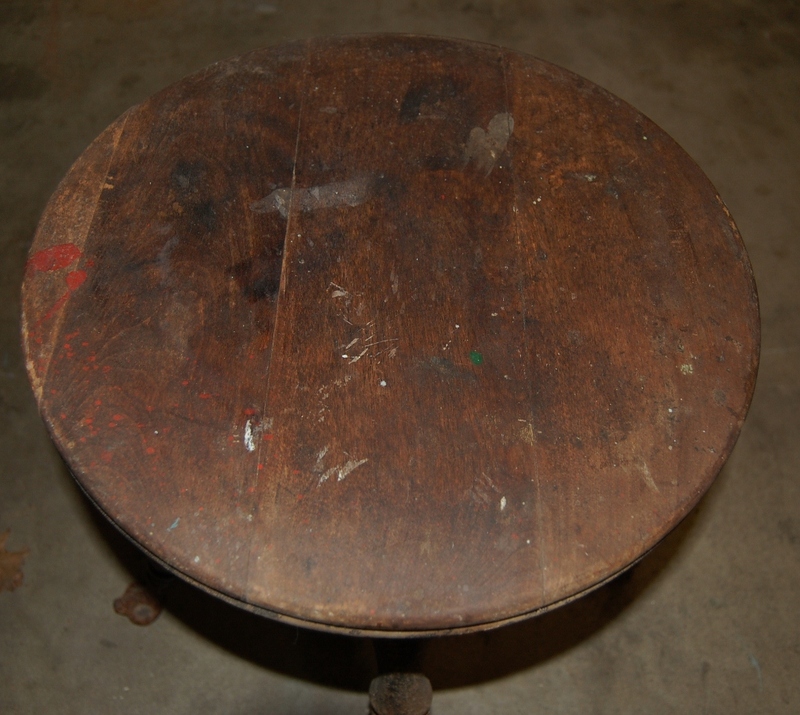 I'm still second guessing myself on the distressing! This was my first time using the Chalk Paint and it went on like a dream, just as advertised. Cassie hasn't seen it yet; hope she likes it! 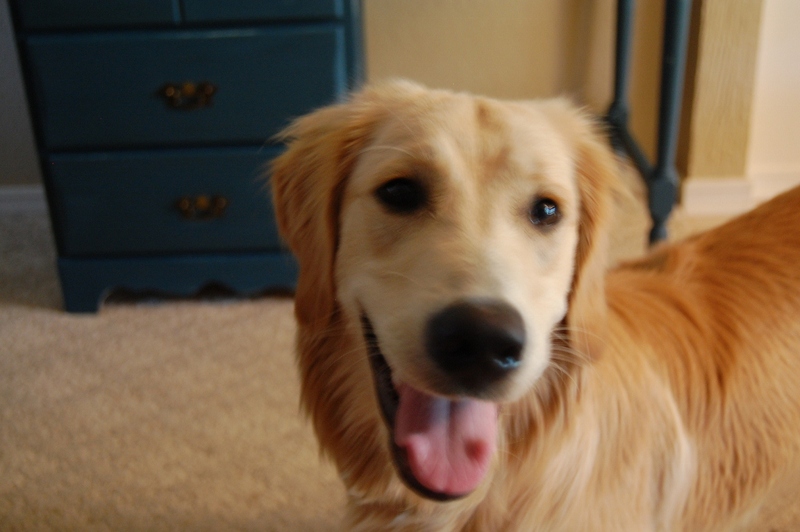 This last picture is just for Cassie; Piper LOVES her Cassie! God has graced me with a wonderful husband and two of the most beautiful daughters in the world. I am a first-time Gigi and my life has become all consumed by the most handsome grandson ever created! 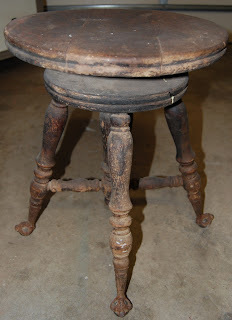 I love to shop thrift stores and yard sales. I enjoy gardening and decorating my home. 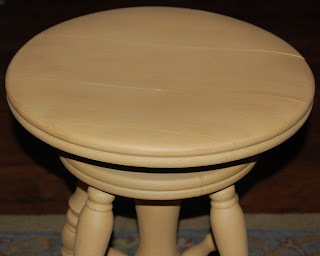 My latest craze is refinishing furniture.